The Sacrament of Ordination is from one of the most celebrated groups of paintings in the entire history of art. The set depicting each of the Seven Sacraments was commissioned from Poussin by the antiquarian Cassiano dal Pozzo, secretary to Cardinal Francesco Barberini. To illustrate ordination—the taking of holy orders to become a priest—Poussin depicted the gospel account of Christ giving the keys of heaven and earth to the kneeling apostle Peter, showing the authority vested in him as head of the Roman church: “You are Peter, and on this rock I will build my church . . . I will give you the keys of the kingdom of heaven” (Matthew 16:18–19). Poussin infused the picture with emotional power, conveyed through the varied gestures and expressions of each apostle. The men discoursing in the distance may refer to the grove of ancient philosophers, recalling the old order that gives way to the new order instituted by Christ. The figure at the far right, with his face obscured in shadow, is Judas Iscariot, who will betray Christ. Charles Manners, 4th Duke of Rutland, purchased the Seven Sacraments from the heirs of Cassiano dal Pozzo in 1785 and installed them at Belvoir Castle, Leicestershire. The duke had consulted the English painter Sir Joshua Reynolds, who proclaimed the series to be “the greatest work of Poussin, who was certainly one of the greatest Painters that ever lived.” Of the original seven paintings, the Duke of Rutland retains Confirmation, Eucharist, and Marriage. 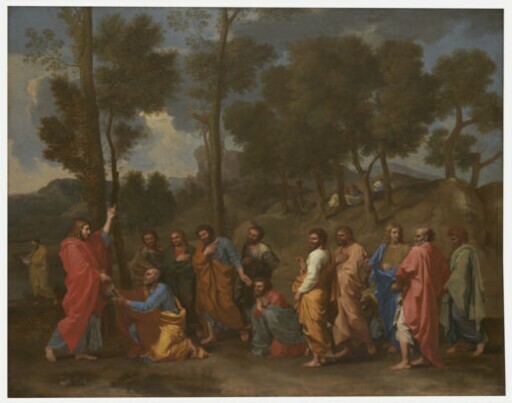 Penance was destroyed in a fire in 1816, and Baptism was acquired by the National Gallery of Art, Washington, in 1946 and Extreme Unction by the Fitzwilliam Museum, Cambridge, in 2012.
purchased from the Trustees of the 11th Duke of Rutland Poussin Settlement by Kimbell Art Foundation, Fort Worth, 2011.